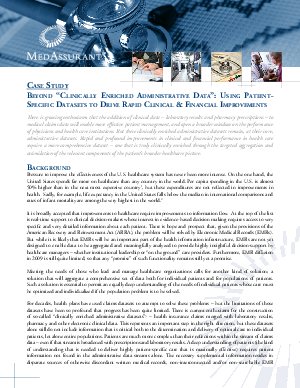 > MedAssurant, Inc. > MedAssurant - Beyond "Clinically Enriched Administrative Data"
Case Study Published By: MedAssurant, Inc. There is growing enthusiasm that the addition of clinical data - laboratory results and pharmacy prescriptions - to medical claims data will enable more effective patient management, and open a broader window on the performance of physicians and health care institutions. But these clinically enriched administrative datasets remain, at their core, administrative datasets. Rapid and profound improvements in clinical and financial performance in health care require a more comprehensive dataset - one that is truly clinically enriched through the targeted aggregation and assimilation of the relevant components of the patient's broader healthcare picture.